I’m not a huge fan of shrimp, but I do try to cook it every once in a while. As usual, I fell back on an Asian inspired shrimp stir fry. I’m someone who thinks you really can’t go wrong with stir fry veggies and some really delicious Asian seasonings. This one really exceeded my expectations. For me, the sweet chili sauce was what made this a little different than my normal stir fry. For my normal stir fry I use soy sauce, sesame oil and rice vinegar. I didn’t want to add the really rich and dark flavor of the hoisin, but the sweet chili sauce added a really delicious flavor without overpowering the flavor of the whole dish. If you are into spicy, don’t let the chili sauce scare you! It adds just a little bit of spice to really bring the whole dish alive. 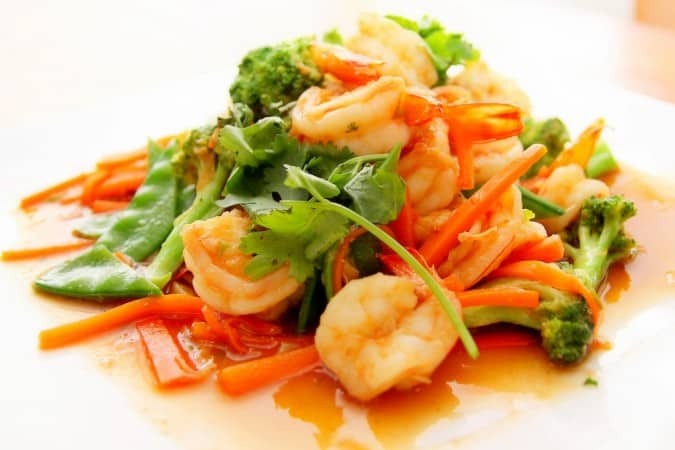 The shrimp is light and a great source of healthy, omega fatty acids. Shrimp is also a great source of lean protein, and the crisp-tender vegetables are a perfect complement to the succulent shrimp. Bright, fresh, crisp-tender vegetables sautéed with succulent and delicious shrimp. The whole stir fry is seasoned with Asian inspired soy sauce and sweet chili sauce. Simple, healthy and delicious. Whisk together the broth, sweet chili sauce, soy sauce and cornstarch. Set aside. Heat 2 Tbsp olive oil in a large pan or wok over medium low. Saute the garlic and ginger for 2 minutes. Add the shrimp and cook until the shrimp is cooked through, about 3-5 minutes. Season to taste with salt and pepper, then remove from the pan and set aside. Heat the remaining oil in the pan. Cook the broccoli, carrots and snap peas for 3-4 minutes, or until the vegetables are tender. Add the sauce and cook for 2-3 minutes, stirring constantly, until the sauce thickens. Return the shrimp to the pan and cook until the shrimp is hot.